"Everything for the Office and Gifts!" 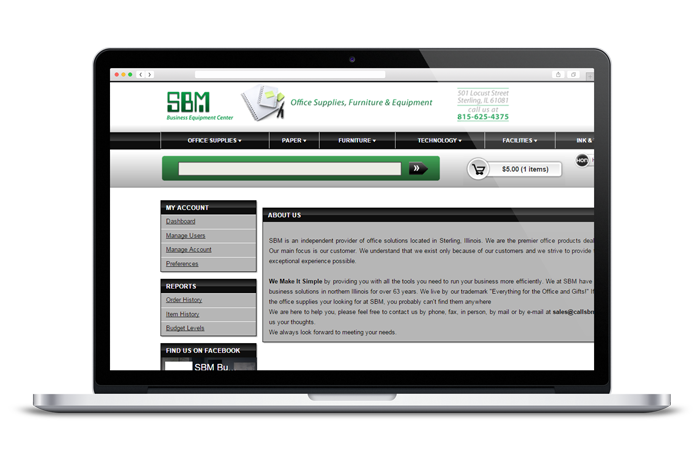 SBM is an independent provider of office solutions located in Sterling, Illinois. We are the premier office products dealer in our area. Our main focus is our customer. We understand that we exist only because of our customers and we strive to provide them the most exceptional experience possible. 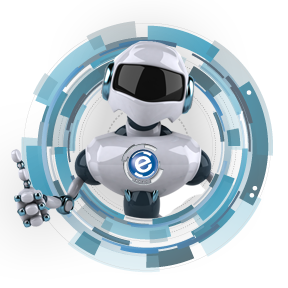 We Make It Simple by providing you with all the tools you need to run your business more efficiently. We at SBM have been providing business solutions in northern Illinois for over 64 years. We live by our trademark "Everything for the Office and Gifts!" If you can't find the office supplies your looking for at SBM, you probably can't find them anywhere. SBM is a privately-owned company that was established in 1954. Before and during the early 1950’s equipment in the office was still very much determined by the pre-war era. At the end of World War II it was typical for small companies to work with old office equipment and machines for a long time. This all began to change beginning in the 1950’s, as there was an increase in the use of modern office equipment. This industry change paved the way for the growth of a significant member of Whiteside County’s business community. It all began in 1954 when a small startup called Richter’s Office Appliance opened up at 416 Locust Street in Sterling, Illinois. The owner Wendelin Richter sold typewriters and calculators. The biggest sellers were Royal Typewriters and Victor adding machines, the “Cadillac’s” of the industry at that time. 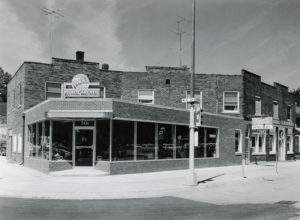 Richter was basically a one-man-show, providing both products and customer service to the local community and businesses. Through the years SBM has flourished, providing everything from office machines to everyday office supplies like staplers, paper clips, and pens and pencils. SBM has always been an innovator by being one of the first to provide and service the newest technologies available to help streamline business for their customers. 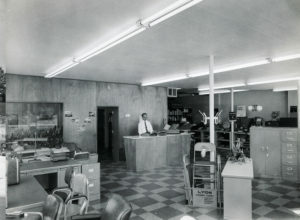 In 1976, SBM became one of the first 20 dealers to sell products from Sharp Electronics which began with calculators and now includes cash registers, multi-function printers, and fax machines. SBM has evolved over the years and still continues to be a one stop shop for not just office supplies, furniture and machines but also for very unique and hard to find gift items, holiday cards, décor, and even kids games. In addition to providing a well-stocked storefront SBM has provided the community with a top notch Copy Center that has become a destination for many members of the community to get all their printing and copying needs. SBM has always had a passionate commitment to the local community by participating in numerous fundraisers and projects that contribute to the betterment of our communities. Recently SBM started a new program assisting our local United Ways by donating part of the proceeds of all the sales of SBM’s private label copy paper. This is just one example of SBM’s ongoing dedication to the local communities.